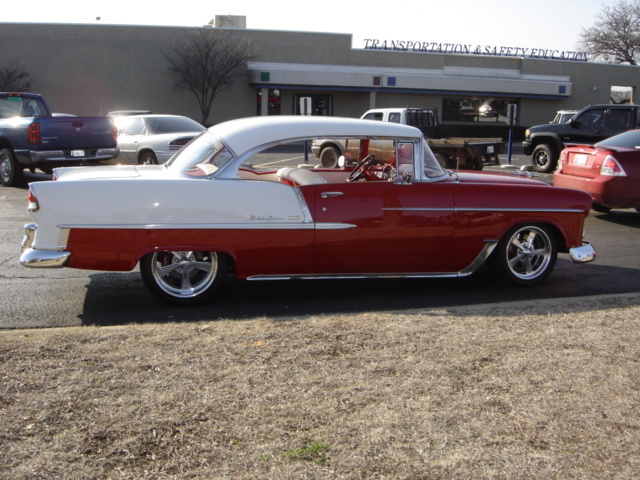 While attending the Central Tech Open House and Auto Show in Drumright, Oklahoma on February 19, we had the good fortune to meet David and Paula Gayanich of Blanchard, Oklahoma and look over their outstanding custom 1955 Chevrolet. Not only did we get to meet some very nice folks but they have a wonderful story about how they acquired this eye catching 1955 Chevy. 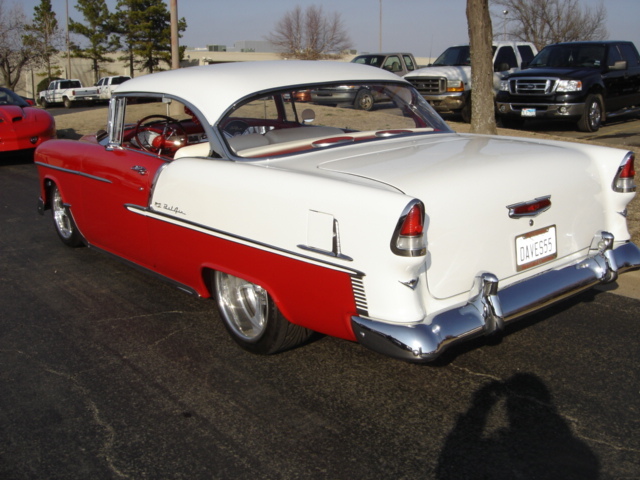 In 1970 when David was just three years old, his father David, Sr. came across this old 1955 Chevrolet in Amarillo, Texas. Ol’ dad made a deal for $400 and brought the old Chevy home and gave it to his three year old son! He even had the title put in three year old David’s name! 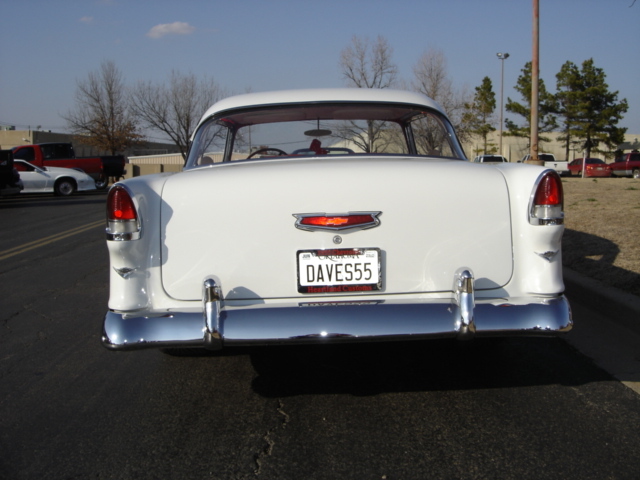 This scenario started a long time relationship with David and his “55”. In the early 1990’s David began the process of bring the old Chevy back to life. He started by removing rust and making other repairs. 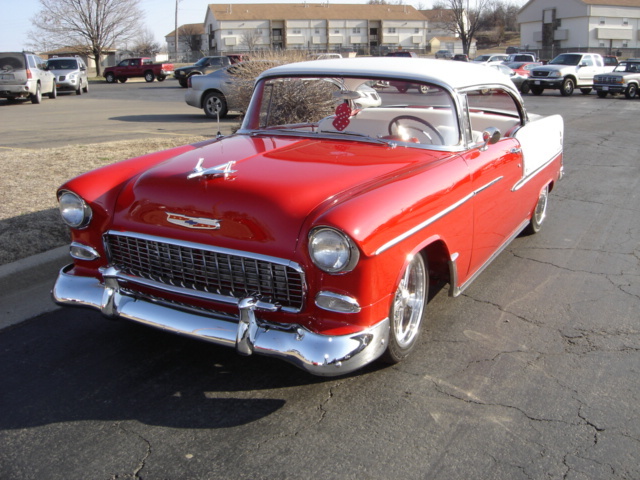 This process turned into years and finally in June of 2008 David contacted the folks at Heartland Customs of Purcell, Oklahoma to speed up the repair process and complete the car. It appears this was a very good decision! Heartland Customs began by doing a complete frame off disassembly and reconstruction. An Art Morrison Custom Chassis was selected along with Boyd Codington Red and Chevy Pickup White custom paint scheme. New inner finders were fabricated and all the bright work and bumpers were re-chromed which brought them back to better than new condition. David selected a 350 cubic inch Chevy small block which puts out 380 horsepower and matched it to a 700R automatic overdrive transmission. 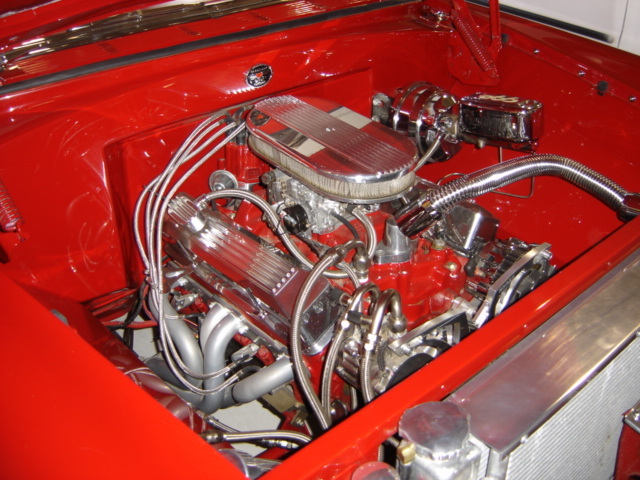 As you can see the engine has been updated with a billet aluminum serpentine belt system along with Vintage Air-conditioning System, custom valve covers, coated headers, electronic ignition, stainless wiring covers and hoses, power brake unit for the Wilwood Disc Brake System, aluminum large capacity radiator and overflow container. 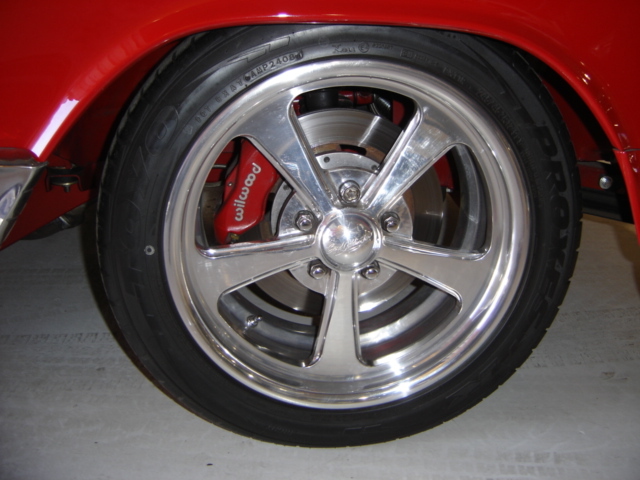 David chose Toyo Tires mounted to 17” Boyd Codington Custom Rims for the front with 18” for the rear to get all of that power to the highway. For the interior work David and Paula selected Superior Interiors out of Oklahoma City. 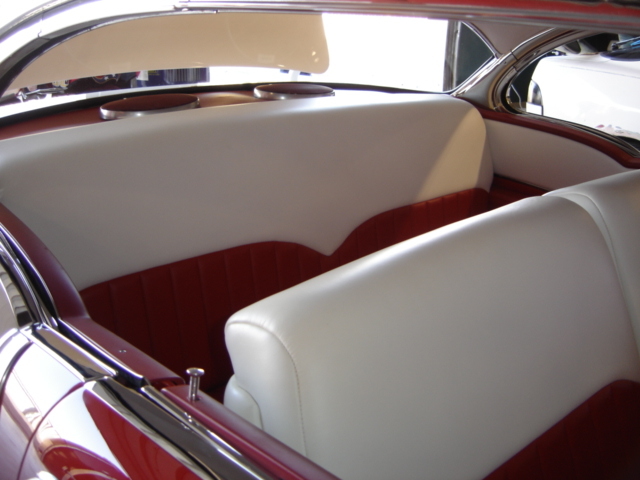 Superior did a complete red and white classic leather tuck and roll for the seats. 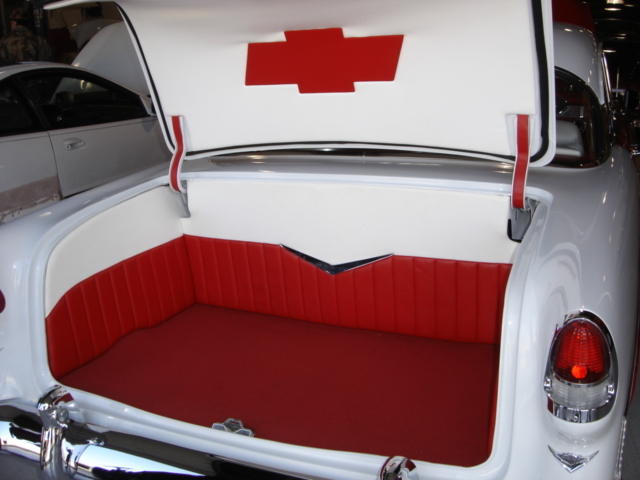 The red and white theme was continued on the door panels, kick panels, package tray, carpets and the headliner. A custom console was fabricated for this eye catching interior. 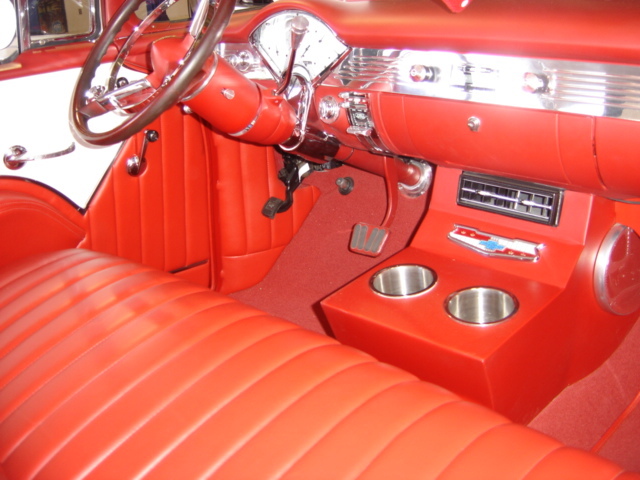 A full set of Classic Instrument’s gauges were installed in the dash along with a custom billet tilt steering column. Even with a great interior like this, it would not be complete without the right sound system, so David and Paula added a Custom Auto Sound System with MP3 jacks, Clarion Speakers, and 10 CD changer. Heartland also closed in the trunk with the same color scheme complete with the classic Chevy Bowtie and chrome V.
Not only did David and Paula’s 1955 Custom Chevrolet BelAir catch our eye but it was awarded the “People’s Choice Award” which is the top award voted by the hundreds of folks that came to look over the Central Tech Facilities and to see some outstanding classic cars and trucks. 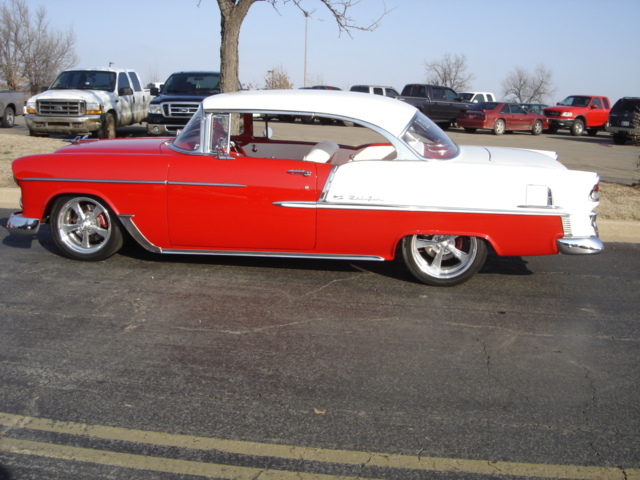 The Cimarron Starlite Cruisers sincerely appreciate David and Paula Gayanich for sharing their custom 1955 Chevy BelAir Hardtop as our Great Oklahoma Classic for March 2012!